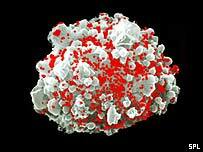 Early research suggests a potential way to eradicate dormant HIV infection, scientists claim in the Lancet. A University of North Carolina team has shown valproic acid - used to treat bipolar disorder - can prevent HIV persisting in this latent phase. The findings may boost HIV treatment and be a step towards preventing HIV from being a chronic disease, they say. But experts cautioned against premature optimism, and said much more research into the drug's effects was needed. HAART (highly-active antiretroviral therapy), which targets virus replication and restores immune function, has improved the outcome for patients with HIV. But the virus can remain dormant in some infected cells, meaning people with the virus have to continue taking medication. If they do not, the virus will emerge from cells as soon as the drugs disappear. It is already known that an enzyme called histone deacetylase 1 (HDAC1) helps HIV to persist in a latent phase of infection. Valproic acid is known to stop this enzyme acting effectively. To test this concept, researchers studied four people with HIV who were already on HAART. They were given enfuvirtide (Fuzeon), which stops the virus entering healthy cells for up to six weeks, to give them added protection against HIV. A three-month, twice daily, course of valproic acid (valproate) was then added to their treatment. The researchers found a 75% reduction in latent HIV infection in three of the four patients over the period they were taking valproate. Dr David Margolis, who led the study, said: "Our findings suggest that eradication of established HIV infection might be achieved in a staged approach. "Patients should perhaps first be treated with standard antiretroviral regimens at an early stage of infection. "For those in whom viral replication is suppressed, latent viral infection could then be tackled with HDAC inhibitors, intensified therapy, or both." In an accompanying piece in the Lancet, Dr Jean-Pierre Routy of McGill University Health Centre in Montreal, Canada, commented: "These results, although preliminary, merit further urgent study. "This is the first glimpse of a new therapeutic approach that might represent a possible step towards making HIV infection no longer a chronic disease." Dr Chris Gadd, of the UK's Aidsmap, which offers advice on HIV/Aids to patients and health professionals, said: "The encouraging message from this study is that using an existing, licensed drug is a feasible, although still highly experimental approach to achieving HIV eradication from these viral reservoirs, at least partially. "The study shows that the hypothesis - that the intensification of antiretroviral therapy with a new drug, coupled with the addition of valproate, can reduce the numbers of resting, infected cells - is feasible. "However, this does not mean that we should be over-confident about the eventual introduction of this approach in HIV treatment. "This study is the first small step towards a fuller investigation, which may well result in this approach falling by the wayside."